With most Makeover Monday approaches I like to review the inspiration and visualization and let that somewhat decide the direction of my analysis. In this case I found that completely impossible. For my own sake I’m going to try and digest what it is I’m seeing/interpreting. And then there’s the final distraction of the sum of the seed values above each bar. What does this accomplish? Am I going to use it to quickly try and calculate an “average seed value” for each year? Because my math degree didn’t teach me to compute ratios at the speed of thought – it taught me to solve problems by using a combination of algorithms and creative thinking. It also doesn’t help me with understanding interesting years – the height of the stacked bars does this just fine. Yes – you have to interact to understand, but once you do it is very clear. Each line represents a win/loss result for the teams. They are then bundled together by their regions to see how they progressed into the Superbowl. In the line chart it is a running sum. 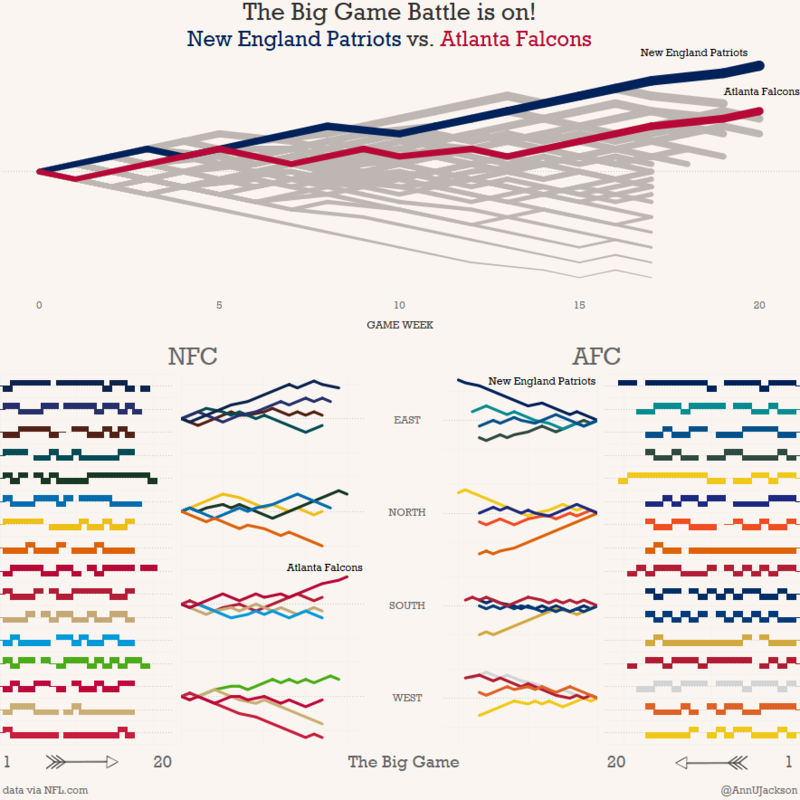 So you can quickly see that the Patriots and Falcons both had very strong seasons. The 49ers were awful. So that was my original inspiration, but I didn’t want to do the same thing and I had less time. So I went a super distilled route of cutting down the idea behind the original article further. Let’s just focus on seed rank of those in the championship. 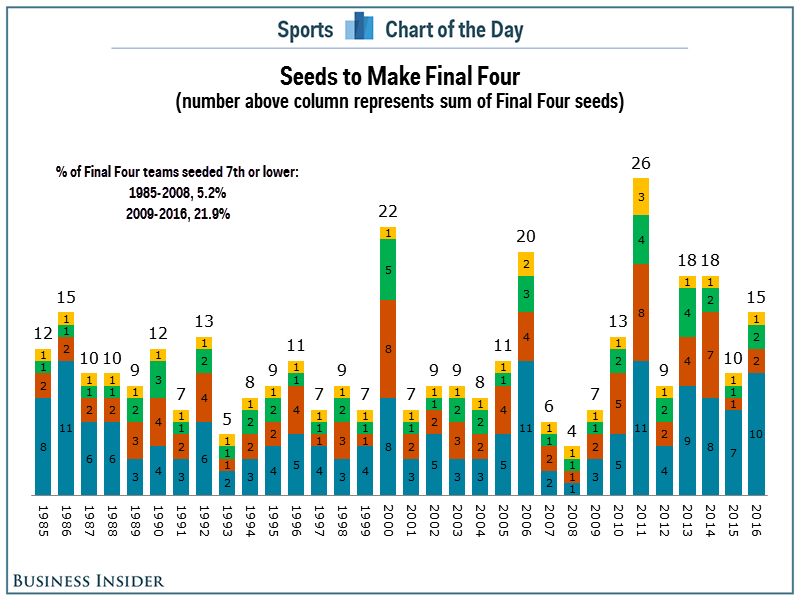 To an extent I don’t really think there’s a dramatic story in the final 4 rankings – the “worst” seed that made it there was 11th. We don’t even know if that team made it further. In my world I’ve got championship winners vs. losers with position indicating their seed rank. Color represents the result for the team for the year and for overall visual appeal I’ve made the color ramp. To help orient the reader, I’ve added min/max ranks (I screwed this up and did pane for winner, should have been table like it is for loser, but it looks nice anyway). I’ve also added on strategic years to help demonstrate that it’s a timeline. If you were to interact, you’d see the name of the team and a few more specifics about what it is you’re looking at. The reality of my takeaway here – a #1 seed usually wins. Consistently wins, wins in streaks. And there’s even a fair amount of #1 losers. If I had to make a recommendation based on 32 years of championships: pick the #1 seeds and stick with them. Using the original math from the article: 19 out of 32 winners were seed #1 (60%) and 11 out of 32 losers were seed #1 (34%). Odds of a 1 being in the final 2 across all the years? 47% – And yes, that is said very tongue in cheek.